Luca Cittadini, Giuseppe Di Battista, Massimo Rimondini. On the Stability of Interdomain Routing. ACM Computing Surveys. 44(4):26:1-26:40. 2012. Luca Cittadini, Massimo Rimondini, Stefano Vissicchio, Matteo Corea, Giuseppe Di Battista. From Theory to Practice: Efficiently Checking BGP Configurations for Guaranteed Convergence. IEEE Transactions on Network and Service Management. 8(4):387-400. Dec 2011. Giordano Da Lozzo, Giuseppe Di Battista, Claudio Squarcella. Visual Discovery of the Correlation between BGP Routing and Round-Trip Delay Active Measurements. Computing. 96(1):67-77. 2014. In 1st IMC Workshop on Internet Visualization (WIV 2012), 2012. Poster. Program: http://ant.isi.edu/wiv2012/program.html. Mohit Lad, Jonathan Park, Tiziana Refice, Lixia Zhang. 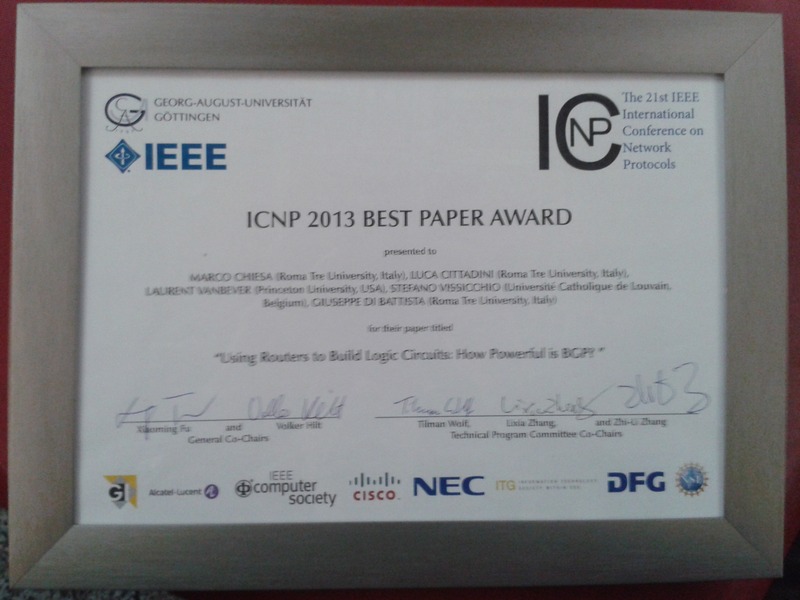 A Study of Internet Routing Stability Using Link Weight. Technical Report 080003, Computer Science Department, University of California Los Angeles, 2008. Alessio Campisano, Luca Cittadini, Giuseppe Di Battista, Tiziana Refice, Claudio Sasso. Update-Driven Root Cause Analysis in Interdomain Routing. Technical Report RT-DIA-117-2007, Dept. of Computer Science and Automation, University of Roma Tre, 2007. Andrea Carmignani, Giuseppe Di Battista, Walter Didimo, Francesco Matera, Maurizio Pizzonia. Visualization of the Autonomous Systems Interconnections with HERMES. 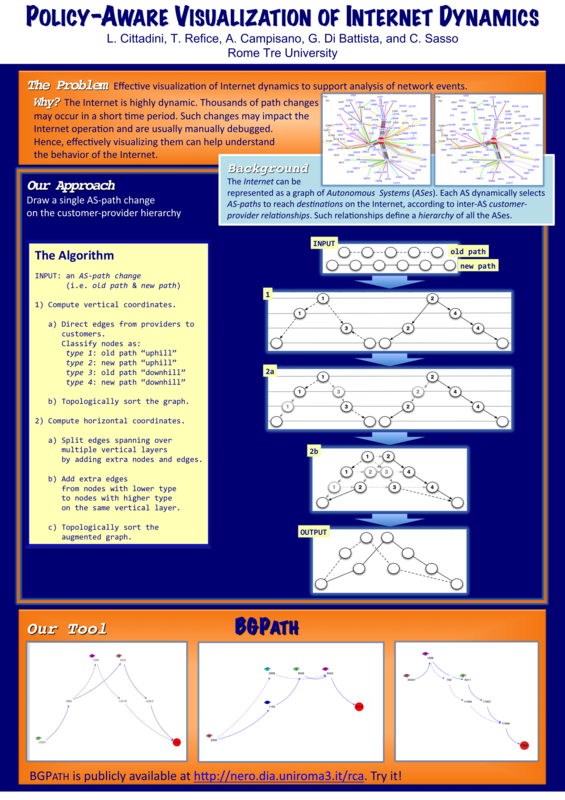 Journal of Graph Algorithms and Applications. 6(3):281-311. 2002. Andrea Carmignani, Giuseppe Di Battista, Walter Didimo, Francesco Matera, Maurizio Pizzonia. Visualization of the Autonomous Systems Interconnections with HERMES. In, Joe Marks, editor, Graph Drawing (Proc. GD '00), Springer-Verlag, volume 1984 of Lecture Notes in Computer Science, pages 150-163, 2000. Andrea Di Menna, Tiziana Refice, Luca Cittadini, Giuseppe Di Battista. Measuring Route Diversity in the Internet from Remote Vantage Points. In Proc. International Conference on Networks (ICN 2009), IEEE, pages 24-29, 2009. Maurizio Pizzonia, Massimo Rimondini. Netkit: Network Emulation for Education. Software: Practice and Experience. 46(2):133-165. Feb 2016. First appeared online in 2014. Massimo Rimondini. Emulation of Computer Networks with Netkit. Technical Report RT-DIA-113-2007, Dept. of Computer Science and Automation, University of Roma Tre, 2007. Giuseppe Di Battista, Thomas Erlebach, Alexander Hall, Maurizio Patrignani, Maurizio Pizzonia, Thomas Schank. Computing the Types of the Relationships between Autonomous Systems. IEEE/ACM Transactions on Networking. 15(2):267-280. Apr 2007. Marco Gaertler, Maurizio Patrignani. Dynamic Analysis of the Autonomous System Graph. In 2nd International Workshop on Inter-Domain Performance and Simulation (IPS 2004), pages 13-24, 2004.